Obama is the Father of ISIS and the New Jihad! Of course Obama did not “found” the radical Islamist group of Sharia jihadis who are rampaging across the Middle East slaughtering Christians, gays, and any Moslem they consider apostates. That group has a leader who founded and leads them. But it’s not Trump’s fault they exist anymore than it is President George W. Bush’s fault they popped up and took over most of Iraq, Syria, Libya, and other places. 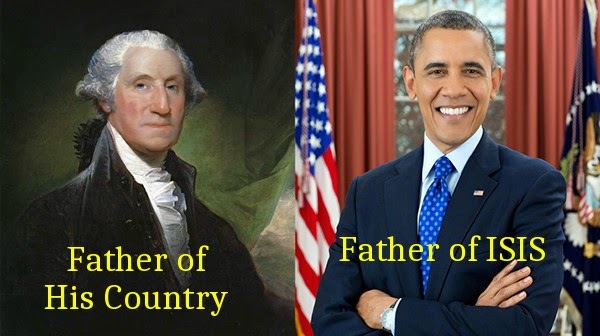 No, Obama is not the founder of ISIS, but he is the father of the New Jihad! Wielding the power of the President of the United States and Leader of the Free World, Obama has used his power to bring America down, reduce her military and economy, and force her allies to submit to Islamic invasion. Of course, he says he’s making the world a better place and the leftwingnut media bows and prays for his beneficence be inflicted on the world as the Great Barack, peace by upon him! Meanwhile, on the home front, Hillary and the leftwingnut media have not only gone to extremes, but actually become psychotic trying to paint Trump as the greedy, insane racist in the campaign while covering up Hillary’s crimes. Hillary and the Democrats are trying to make Trump out to be the next Hitler, a racist that must be eliminated before the he creates the next Holocaust. The all cry that Trump threatened Hillary with gun violence by saying 2nd Amendment people will object to her appointing a Supreme Court Justice to take away guns from citizens, but it is leftists who are calling for someone to assassinate Trump! Once again it is the Left that plots to destroy people as the Left is the birthplace of Nazism, Communism, Fascism, and Islamism. They start by disarming the populace and then comes the “re-education camps.” Hillary says she has a plan to save the American economy that she apparently hasn’t shared with Obama in eight years! She says she will make the largest investment in job creation since WWII! How does Hillary plan on “investing” in the economy? Translation – take more taxes! And at the same time leftwingnut Democrats will launch their new America under the boot of Islamo-Nazi Communist tyranny and make the taxpayers and citizens pay for opposing her and her Democrat cronies. This entry was posted in Election 2016 and tagged 2016 Presidential Campaign, Barack Obama, Democrat agenda, Donald Trump, Hillary Clinton, Hillary's economic plan, ISIS, Islam, Jihad, Obama Father of ISIS, Obama Father of the New Jihad, Obama foreign policy, Sharia. Bookmark the permalink.